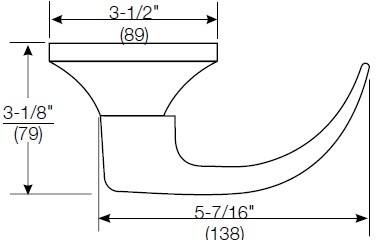 "Grade 1 Cylindrical Lever Locks"
- Lever Option: Pacific Beach (PB). - Delivery: All Yale 5400LN Grade 1 Leversets are factory-ordered, please allow 3-5 working days' lead time. Function: The Yale 5400LN Series Levers are available in Passage (5401LN), Privacy (5402LN), Keyed Entry (5407LN), Classroom (5408LN), Storeroom (5405LN), and Single Dummy (455LN) function. Finish: The Yale 5400LN Series Levers come in Brass (605e) and Satin Chrome (626) finish. Lever Design: The Yale 5400LN Series Levers come in Pacific Beach (PB) design. Cylinder Options: All Entrance (5407LN), Classroom (5408LN), and Storeroom (5405LN) functions are sold Less Cylinder; see "Companion Items" above for all Cylinder & Keying options. Special Order Information: For pricing on any function or finish of the Yale Commerical 5400LN Series Levers not found on this page please contact Taylor Security direct via e-mail (sales@taylorsecurity.com) or call us toll-free at 1-800-676-7670. Special Order Information: For pricing on any function or finish of the Yale Commercial 5400LN Series Levers not found on this page please contact Taylor Security direct via e-mail (sales@taylorsecurity.com) or call us toll-free at 1-800-676-7670.